In Palo Alto, Los Altos and surrounding communities, the residential real estate market continued to recover in the 1st quarter of ’10. Supply and demand continued to move back in favor of sellers with multiple offers common and prices rising.
? Q1-2010 vs. Q1-2009 ? Several factors – including improving consumer confidence and lots of rain – caused the number of homes for sale in our market area to decline by 20% on average from a year ago. Sales volume, on the other hand, increased by 55%. The number of days it took for homes to sell (Days on Market) was essentially unchanged. This number can be easily misinterpreted. As the market heats up, homes that had been sitting unsold become more attractive and start to sell – thereby increasing the average number of “days on market”. 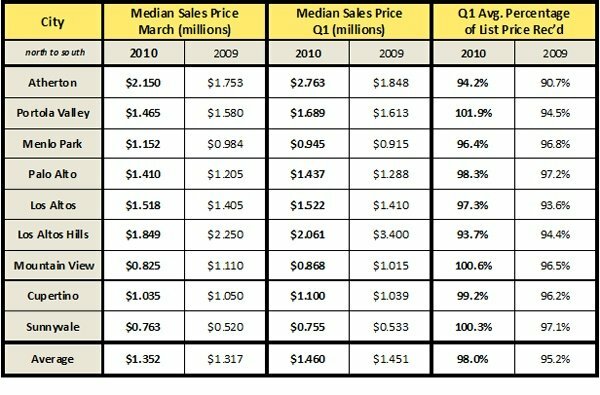 Median sales prices also were basically unchanged. That figure has more to do with which segment of the market is selling in each community. For example, median sales prices were up by 40% in Sunnyvale and down by 40% in Los Altos Hills. Home values have not changed by those amounts. Folks are simply buying more expensive homes this year in Sunnyvale and less expensive homes in Los Altos Hills than last year. The average percentage of list price received by sellers shows the impact of the reduced supply and greater demand. It increased to 98%, on average, in 2010 from 95% in 2009. Can This Market Continue to Improve? Yes, if the U.S Treasury and Federal Reserve Bank (with the assistance of Congress) are able to manage the massive financial de-leveraging that’s taking place. If they are able to continue to underwrite the staggering quantity of commercial and residential loans currently “under water” (without causing inflation and interest rates to spike) then yes, this rebound in our residential market will continue to improve. Buyers are very motivated at the moment, particularly in the under-two million dollar range. As stated above there is dwindling inventory. However, buyers are extremely sensitive to any perceivable “negative” issues relating to condition or location and expect to pay less as a result. Improving the home’s condition prior to putting your home on the market is very profitable. Interest rates will soon rise. How high and when? No one knows. Plus, home values in our area are rising. Although selection is very limited at the moment, buying soon and locking in a low 30-year fixed rate mortgage will most likely prove to be exceptionally profitable. Buying a home that is in need of surface improvements will also be profitable. One’s particular buying strategy, home selection, and ability to hold long-term are always critical to success.